Serious games can be highly frustrating or extremely boring. They are then not the effective educational tools that they were supposed to be. Serious games are designed to contribute to achieving a specific purpose other than mere entertainment. As such, they may be helpful to better understand complex management issues or engineering topics. However, those purposes may actually never be achieved when a game is designed poorly. I have experienced exactly that with a serious game that I have designed for construction supply chain management. Here’s how a theoretical model from the 1970s helped me to promote the learning potential of that game. Over the past year, I have been facilitating numerous workshops for the serious game ‘Tower of Infinity’. This one-player serious game enables players to experience what it takes to coordinate activities in a construction supply chain. Participants of the workshops were students, practitioners, educators as well as researchers. Some of those workshops are documented on this website (like here), others are not. All workshops basically consist of two parts. Initially, the same game was played during these two consecutive parts (although with different game parameters). The idea behind that was to study whether people could apply the lessons from the first part of the workshop during the second: the assumption was then that the game results would improve over time. This original plan did not work. I observed expressions of frustration during the first part of some of the earlier game workshops. Players frequently seemed overwhelmed by the number of available game actions, rules and constraints. They had difficulties to start with the game and had a lot of questions. As there were sometimes too many questions to handle alone (especially in bigger groups), I had to rely on the assistance of some colleagues who would be helping me with answering rule-related questions. The atmosphere would sometimes be noisy. I could also see from their game scores that some people misinterpreted the rules or were not able to finish in time. Occasionally, a player even stopped playing. The second part of the workshop nevertheless always went much smoother. There were very few questions, much more people could finish the game in time and game scores were more consistent with each other. A striking observation is that, with no exception, I have always witnessed moments of complete silence during the second part of a game workshop. At these times, all players seemed very engaged with the game (and only the game). 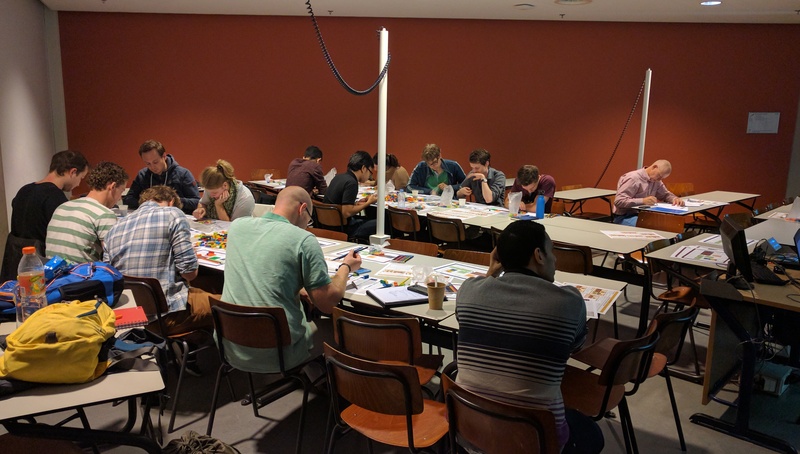 A workshop with students even resulted in the situation that people preferred continuing playing the game over having a scheduled break (and getting coffee). These two completely different accounts of basically the same game during a single workshop are quite remarkable. They forced me to change my data collection and analysis plan. But how can these differences be explained? An answer can be given with a famous model that originates from the 1970s. Around that time, the Hungarian psychologist called Mihaly Csikszentmihalyi found that a person’s ‘level of competence’ and the ‘difficulty of a certain challenge’ interact and result in different cognitive and emotional states. When the level of competence is too low and the challenge too hard, people become anxious. Alternatively, when the level of competence is too high and the challenge too easy, people become bored. However, when the level of competence and the difficulty of a task are roughly proportional, people enter so-called flow states (Figure 1). Flow is the condition in which people are completely engrossed in a task and lose sense of time and place. This condition is characterized by high focus, engagement, motivation, and immersion. Back to the earlier serious game workshops I organized. Players seemed to be in a state of anxiety during the first part of the same workshop: there was a lot of frustration resulting from a mismatch between the game challenge and the acquired level of competence. On the other hand, these same players seemed to have reached a flow state during the second part of the workshops: they were highly focused and motivated as the game challenge and the level of competence matched much better (Figure 2). 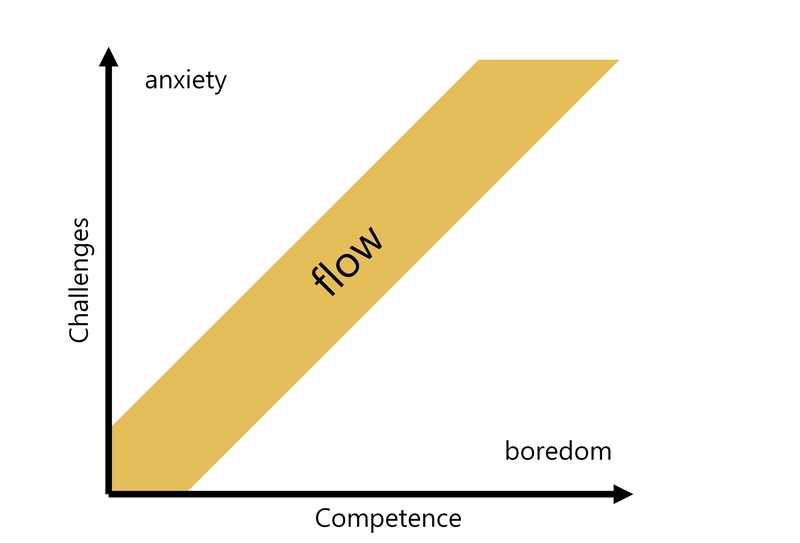 The condition of flow is desirable, as this is the state where people use their learning potential to the fullest. After realizing the mismatch between players’ level of competence and game challenge in the first part of the serious game workshop, I decided to redesign the game and the workshop. The second part challenges players to use LEGO bricks for design and construction tasks and poses a number of constraints (like total project duration). Here, players experience the simulated real-world situation to the fullest. Obviously, its challenges had to be reduced for the first part of the game. I did that by simplifying the in-game task (only constructing, not designing) and by removing some constraints (no maximum duration). These dramatic simplifications greatly reduced the challenges posed to players (Figure 3). Additionally, I conducted a number of other improvements, such as an update of the rulebook (which I reduced to one graphic rather than a two-page written document). The changes aimed to achieve a state of flow during both parts of a workshop. The changes worked out well. During the latter workshops, there were fewer questions, far more people finished their game plays and there were moments of complete silence (high levels of immersion) in both rounds. This suggests that players of the game now reach a flow state during both rounds of the game. It is at that moment that players utilize their learning potential to the fullest. Matching levels of competence and in-game challenges is thus crucial to make a serious game a success. As described above, I learned that only actual game play workshops can reveal whether a serious game beats both anxiety and boredom. Hoi Marc, leuk om je blogs over serious gaming te lezen. Het blijft lastig om een serious game te ontwerpen. Te veel regels en mensen gaan vals spelen, te weinig regels en je laat te veel aan toeval over (play). Key is wat mij betreft om bij een spel met meer regels te zorgen dat mensen langzaam de tijd hebben om regels te leren.